In a dramatic day, ,Greece became the first advanced economy to default on loans from the International Monetary Fund after European finance chiefs shut down Athens’s last-minute request for emergency financial aid, only to see Greek Prime Minister Alexi Tsipras coming back with a letter saying he was ready to accept almost all creditors’ austerity conditions in return for a third bailout worth € 29.1. In a letter to European Commission President Jean Claude Juncker, European Central Bank President Mario Draghi and International Monetary Fund Managing Director Christine Lagarde, Tsipras signaled sticking points remain on pensions and tax discounts to Greek islands. Mr Tsipras’ new letter marks a serious climbdown from his last position and suggests he is yielding as his country buckles under capital controls. Greece missed a payment to the IMF on Tuesday and is headed for a July 5 referendum called by the premier on austerity as a condition for aid. The question remains whether the sticking points are acceptable to creditors. 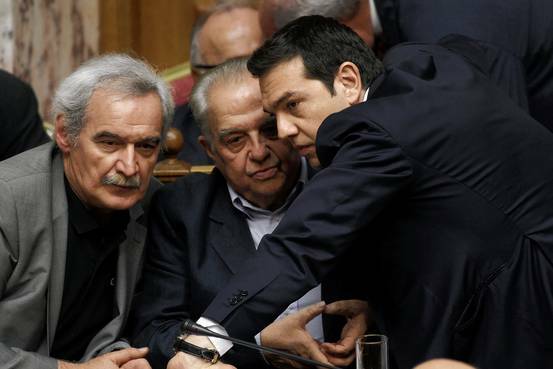 Tsipras is battling ideologues who are hell bent on sticking it to Greece. In Berlin, German Finance Minister Wolfgang Schaeuble said Greece was sending mixed signals and called on its government to “clarify its position” before negotiations with creditors can resume. Nonetheless, The Wall Street Journal reports that the markets have reacted favourably although it’s still anyone’s guess what will happen next. EU leaders are wringing every last concession from the Greeks. Along the way, they are destroying EU values of democracy, solidarity,and prosperity for all. This entry was posted on July 1, 2015 at 10:46 am and is filed under Uncategorized. You can follow any responses to this entry through the RSS 2.0 feed. You can leave a response, or trackback from your own site.